Russian President Vladimir Putin has congratulated Patriarch of Moscow and All Russia Kirill on the fifth anniversary of his enthronement. “I know for sure that these five years felt like one day for you because you spend all your time on people and work occupying yourself both with religious activities and welfare work,” Putin noted, talking to the Patriarch during their meeting. “Thank you so much for this. Let me wish you good health and further successful work,” the President said. 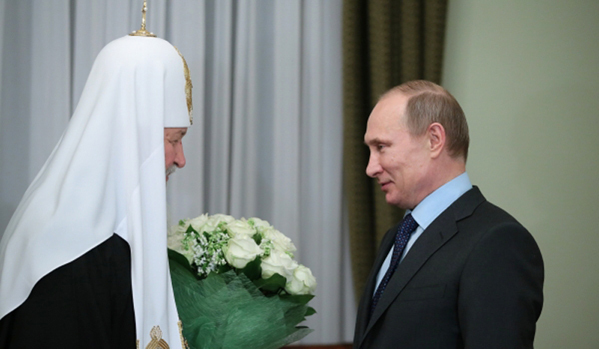 Patriarch Kirill thanked the head of state for his words and answered that “indeed, five years felt like one day. However, I realize that it was special time as many things are changing in church as well as in the country”. “For my part, I try to do my best in order to contribute to all the good things happening in people’s life, in church so that they can continue developing for the greater good,” the Patriarch is convinced. Archbishop of Smolensk and Kaliningrad Kirill was elected Patriarch of Moscow and All Russia in the late January 2009. The ceremony of enthronement took place on January 1, 2009.